Switchgrass. Photo: Dennis Pennington, Bioenergy Educator, Michigan State University. It’s important to buyers, who rely on predictable quality and quantity of feedstocks. Because feedstocks are hard to transport long distances and transportation can be interrupted outside forces such as weather, refiners look for dependable supplies. They also need the quality of the feedstock to be consistent for the most efficient and profitable conversion into bioenergy. Find more detailed information in this article: Logistical Challenges to Switchgrassas a Bioenergy Crop. Contributor: Amy Kohmetscher, Distance Education Specialist, University of Nebraska-Lincoln, and CenUSA Bioenergy collaborator. Switchgrass is a warm-season grass native to most of North America except the West Coast, and it should thrive in any area suitable for dryland corn. Cultivars specific to regions are available for most of the United States. In the southern and mid-latitude regions, lowland cultivars such as Alamo and Kanlow grow well. In mid- and northern latitudes, upland cultivars, such as Shawnee and Sunburst, are best suited. New cultivars are being released for most regions, so check regularly with your local experts for cultivar selection. 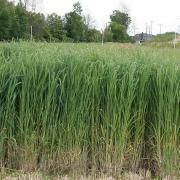 For more detailed information, see this article on successful establishment of switchgrass. Contributor: Rob Mitchell, USDA-ARS Grain, Forage, and Bioenergy Research Unit, and CenUSA Researcher. The best planting date for switchgrass in your region will depend on soil temperature, and moisture. It will range from late March in the Southeast to late June in the northern Great Plains. A good rule of thumb is to plant switchgrass two to three weeks before or after the best date to plant corn in your area. Do not apply nitrogen (N) fertilizer or manure in the year that switchgrass is planted, because too much N encourages weeds that compete with the seedlings, and boosts your cost of establishment. Take a soil test in the fall before seeding to find out if phosphorus and potassium need to be applied to encourage root growth. Weeds typically are not a problem after a switchgrass stand is established, because mature switchgrass plants tend to out-compete weeds. However, this requires good fertility and harvest management. An established, well-managed switchgrass field might require herbicide applications* one to three times every ten years to control broadleaf weeds, though in some states there are no herbicides labeled for use on switchgrass.. If cool-season grasses like Kentucky bluegrass or smooth bromegrass become a problem, harvest switchgrass after it’s dormant but while the cool-season grassy weeds are still growing and apply glyphosate* at 1 to 2 quarts per acre. Check with your Extension agent to find out if there are herbicides labeled for use on switchgrass in your state. For more detailed information see: Control Weeds in Switchgrass. Contributor: Rob Mitchell, USDA-ARS Grain, Forage, and Bioenergy Research Unit, Lincoln, NE. Mow switchgrass to a 4- to 6-inch stubble. Although leaving extra height will cut down on yields somewhat, it will help the stand survive the winter by trapping protective snow cover, as well as reduce tire damage from the hard stubble. You can use the equipment traditionally used to harvest forage crops, but because the switchgrass should have high yields, the equipment will perform differently. Ground speed and field productivity will be lower, for example. Use a disk cutter-bar mower and adjust it for higher yields of biomass. Research shows that the most effective method for quicker drying is a combination of intensive conditioning to crush and shred the stems, and wide swathing across the full cut-width. Paying attention to storage practices can cut down on DM losses, which could run as high as 25 percent%. For instance, losses from large round bales are typically less than from large square bales, silos or Ag-bags. But you should carefully compare costs—it may be cheaper to accept some DM loss compared to buying a new baler or constructing a building. Find more detailed information in this article: Logistical Challenges to Switchgrassas a Bioenergy Crop Contributor: Amy Kohmetscher, Distance Education Specialist, Ohio State U., and CenUSA Bioenergy collaborator. For more detailed information, see this article on Management Practices Impact Greenhouse Gas Emissions in the Harvest of Corn Stover for Biofuels. Contributor: Virginia L. Jin, Research Soil Scientist, USDA-Agricultural Research Service. Should I begin establishing switchgrass in case they put a cellulosic ethanol plant nearby?